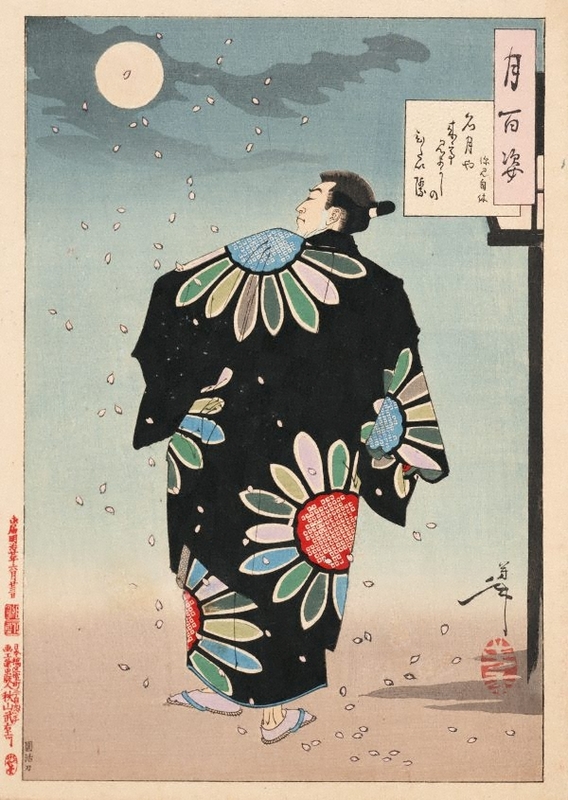 Dressed in a black kimono with bold, colourful sunflower patterns, and striking a proud pose as if challenging the moon above, Fukami Jikyū is the epitome of the folk heroes known as 'otokodate'. Formerly low-ranking samurai, who lost their employment during the peaceful Edo period, 'otokodate' were courageous, chivalrous men who protected the rights of the urban townspeople against attacks by street-gangs and harassments by idle samurai. 'Otokodate' were below the law and made a living from the proceeds from gambling, but nevertheless they enjoyed widespread support from townspeople.